This function expands on the Measuring Blocks function and lets you select up to 12 measuring values from as many as 12 different groups from a selection dialog that shows the contents of the measuring values. In non-UDS modules, this function is available only when a label file exists for the control module being accessed. For controllers using the UDS/ODX/ASAM protocol, the Measuring Blocks function is not available and you MUST use Advanced Measuring Blocks instead. For controllers using the UDS/ODX/ASAM protocol, the �Group UDS requests� checkbox can speed up sample rates. The Advanced Measuring Values function has two screens, the main one shown above and the Item Selection Window shown below . Check each value you would like to show and uncheck each that you would like to remove. For controllers using the UDS/ODX/ASAM protocol, the naming of each Location should coincide with factory identifiers for various data objects like IDEnnnnn. Use the data entry box on top to filter only the items containing the word you enter such as �distance� shown here. Use the [Clear] button to remove the filter. Give the file a name and specify the directory if desired. Non-UDS modules will have file name extensions starting with "a" like ".a01" while UDS ones will start with a "u" like ".u01". 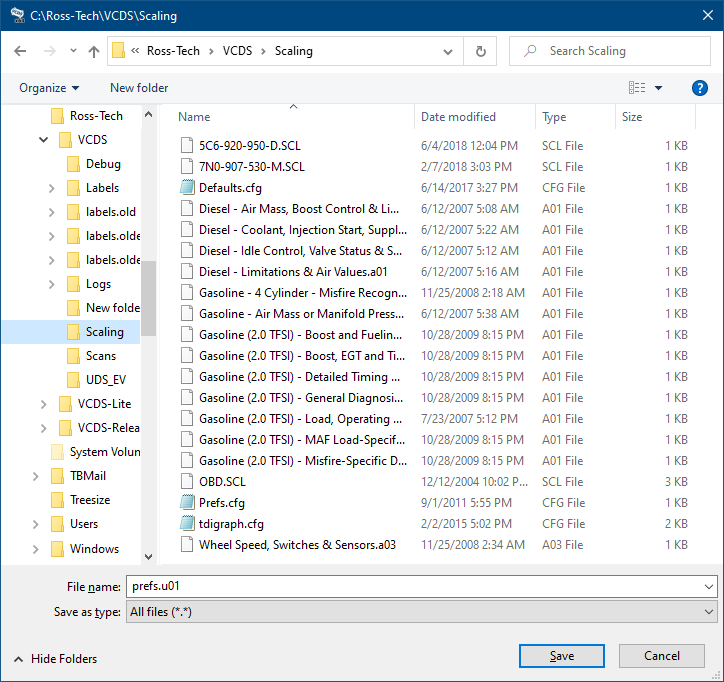 To load a set of previously saved items, click on the VCDS logo found on the top left corner of the item selection window, then select "Load selection from file". Locate the previously saved file and click [Open]. When you have one or more measuring group with speed (km/h) in it, clicking on [Acceleration] will bring up the Acceleration Measurement function, which is described on the Acceleration Measurement page. The amount of data acquired in a given amount of time is determined by the controller in the vehicle. Selecting a greater number of different Groups will result in slower sampling so momentary "spikes" or "dips" will be harder to capture. 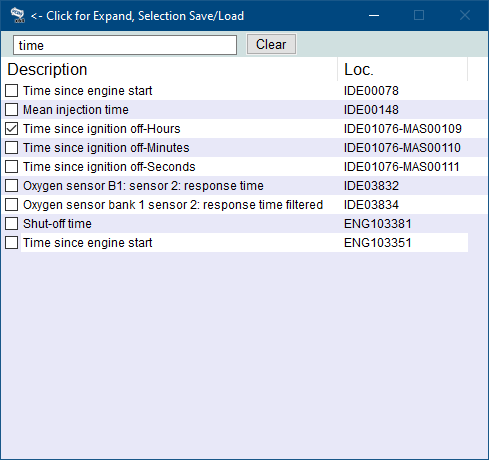 In Engine controllers using KWP-2000/CAN/UDS, there is a [Turbo] button to significantly speed up sampling, for example over 30 samples per second when logging a single group in the engine in a 2004 Touareg V8. Once you have pressed [Turbo] you will remain in this High-Speed mode until you exit the Advanced Measuring Blocks screen. Some combinations of ECUs and PCs may not play well with this function (especially in combination with Group UDS Requests). If you get undesirable results like a dropped session or bogus data, you should exit out of the controller and get back into Advanced Measuring Values but without clicking on [Turbo]. This function is only available when using a HEX Interface. When using a HEX-NET or HEX-V2 interface, you can select a value by which to split Grouped UDS requests. You should select the highest value that allows data to be displayed for all of the checked items (instead of "N/A"). You can [Log] the data from the Advanced Measuring Blocks screen. For more information see the Data Logging page. 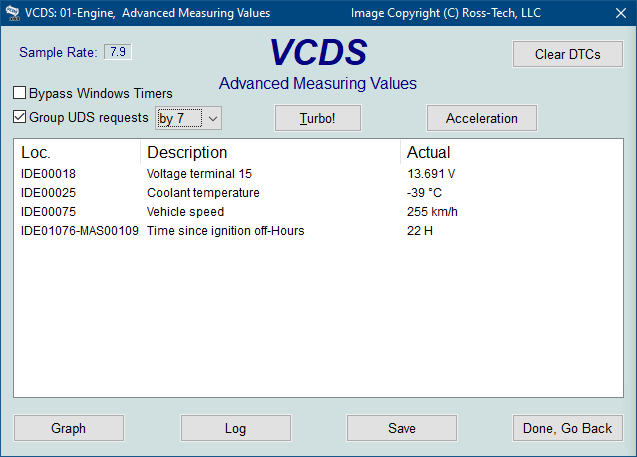 [Graph] will open up VC-Scope, a plug-in for VCDS that allows you to graph Measuring Group Information and display customizable virtual gauges. For more information, see the VC-Scope page. Use [Done, Go Back] to return to the Open Controller screen. If you wish to observe real-time data while driving the car, please use a second person! Let one drive while the other observes the data, making sure the person holding the PC is not in front of an active airbag! Note: For non-UDS controller, you may also want to try the Measuring Blocks function, which accesses the same data but in a different format.